If you've got television, you've most likely seen the Always commercial telling you how their plastic pads are going to make your life easier, fresher, and yes, happier. The truth is, plastic disposable pads aren't all that great--they're full of all sorts of chemicals, very pricey and make weird noises in public restrooms. They're also totally not breathable and they're boring. Yup, I said boring. 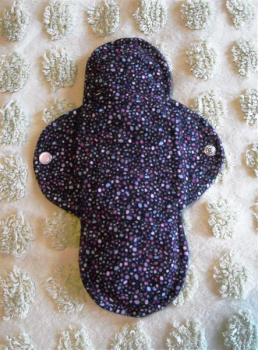 Cloth pads make sense in many ways. They're a much greener choice--no weird gels to soak up exponential amounts of Aunty Flo, no pads piling up in your local landfill. They're highly breathable and I no longer experience the grown-up diaper rash that I had with plastic pads. Some women find their periods are shorter and lighter with cloth pads, and this has been true for me. Like other cloth items such as napkins and diapers, you buy or make them once and use them for years. You can even use them postpartum. For less than $200, you can have menstrual protection to last five years or more.